Once upon a time bloggers and blog-readers all felt some respect or admiration for BRK (of BRK Enterprises). Sure we could disagree and see holes. He helped the novices be less novice. He had good tips. He was full of personality. He brought energy to huntering. 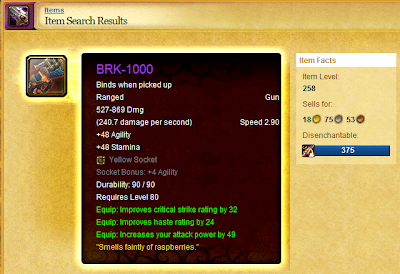 He has since retired and has been immortalized in game via a Best-in-Slot item for the most important slot hunters have. It appears to be a replacement name for Fezzik's Autocannon.